Alfred Hitchcock’s masterpiece of voyeuristic thrills. I’ve been worrying about this blog post ever since I signed up for the blogathon. How could I possibly say something new about Rear Window? So much has been written about the film, about Alfred Hitchcock, James Stewart, and Grace Kelly that there doesn’t seem to be anything left to say. Every reason why it’s great has been mentioned, every theme unpacked. Even the little touches have all been mentioned before. What hasn’t been stated is why I like it. I could say that it’s because I like mysteries. But Rear Window isn’t really a mystery. It’s a thriller. Alfred Hitchcock is the “master of suspense,” not the “master of mystery.” And, yet, having seen it dozens of times—maybe I’m into triple digits, I never counted—it’s hardly very suspenseful. I know how it turns out. I don’t have to worry about the characters. There are no surprises anymore. Even the delightful turns of dialogue have lost their freshness now that I can recite the dialogue from memory. When people mention their favorite films, they often discuss how the film moved or inspired them. I can’t say that. “Moving” and “inspirational” are not adjectives that can be applied to Rear Window. It’s not even a film that is intellectually engrossing. Hitchcock is an entertainer, first and foremost. Rear Window is entertaining. But “entertaining” is not an adjective we associate with greatness. The film is great. It’s an example of perfect craftsmanship, so outstanding as to rise to the level of art. The intricate set was one of the largest ever built at the time. The camera spends a lot of time panning through it, creating a sense of place. After seeing it a few dozen times, I recognized that every apartment was filled with people in different romantic situations. Residents included the single, lonely Miss Lonelyhearts, the happy bachelor songwriter, the social butterfly Miss Torso passing time while her beau is away in the army, the elderly artist who may be a widow or an old maid, a newlywed couple, a couple with children, a childless middle-aged couple, and the Thorwalds, the thoroughly unhappy, long-married couple, whose marriage ends in murder. The script, by John Michael Hayes from a short story by Cornell Woolrich, is clever, but its cleverness goes beyond dialogue. It creates thematic complexity that indicts the whole project of movie-going as a form of voyeurism. It builds a protagonist, a seeming bystander, who is thoroughly intertwined with both the crime of the film and this theme. The opening series of shots, which pan across a Greenwich Village courtyard and continues through the apartment of L.B. Jeffries (Stewart), establishes several facts about Jeffries (Jeff) without any dialogue. The audience learns that he has a broken leg, is a photographer, and probably got his leg broken while photographing a car wreck. These facts suggest certain character traits. As a photographer, a professional observer, Jeff looks at the world with a keen eye, recording events and actions, but he himself does not act. Even though he is willing to put himself in danger, as in standing in the middle of a racetrack, he does not so much participate in life as watch, experiencing life vicariously. The act of watching and vicarious action are important thematic concerns in the film. Both Mr. and Mrs. Thorwald parallel Jeffries. Like Mrs. Thorwald, he is an invalid, confined to one space, and, as Mr. Thorwald poses a threat to his wife, Lisa (Kelly), Jeff’s girlfriend, threatens the life Jeff has established for himself. Of course, Mr. Thorwald kills his wife, and Lisa merely wants to domesticate Jeff. Mr. Thorwald provides a deeper comparison to Jeff. Just as the salesman is trapped in marriage to an invalid, Lisa seeks to contain Jeff in marriage. Jeff’s secret desire for resistance becomes actualized in the murder of Mrs. Thorwald, an action Jeff can experience vicariously through watching. The connection between the two men becomes reinforced when, realizing he is being watched, Thorwald stares into Jeff’s apartment. Thorwald has taken on Jeff’s role; the watched has become the watcher. Jeff, in turn, is then placed in the vulnerable position of the one who is watched. When Thorwald turns to stare at Jeff, he looks straight into the camera and, thus, appears to be staring back at us, the audience—the filmgoers, who live life vicariously and get our thrills from watching others. The performances remain outstanding. Too often, older films play badly because styles of acting have changed in the last half century. We no longer value seeing the performers emoting. Rear Window doesn’t have that problem. The performances by James Stewart, Grace Kelly, Thelma Ritter, Wendell Corey, and Raymond Burr are understated and timeless. When I saw it recently, I appreciated how wonderful Corey is. He gets mentioned least of the stars when people praise the film. He doesn’t have the attractiveness or pluck of Kelly or the wise-cracking wit of Ritter. He doesn’t hold the movie together, as Stewart does. His role is the thankless one of the skeptic who has to spend most of the movie being wrong. And, yet, his doubtfulness comes off as intelligence. He conveys the sense that his Detective Doyle is outthinking Stewart’s Jeffries. Every glance he makes is meaningful. The filmmakers—the writer, the performers, the director—put care into every shot and every detail, knowing that viewers will be influenced by every aspect, no matter how small, even if they don’t understand what’s affecting them. First-time viewers of the film might miss the birds that loom on Miss Torso’s roof—for Hitchcock a sign of danger, as is shown later in Psycho and The Birds. These viewers might not understand what is different in the shot when Lisa first appears in the movie, how the slow-motion and missing frames as she bends down to Jeff make her seem as if in a dream, something not entirely real—like a flickering image on a screen. We’re back to the film consciously calling attention to the act of viewing movies. Casual viewers may not immediately recognize the songs in the film—“Mona Lisa” and “To See You Is to Love You”—the former commenting on the confounding enigma and beauty of the heroine (also named Lisa) and the latter again referencing the idea of watching and voyeurism. They also may not notice the heavy presence of ambient noise throughout. On a basic level, this use of sound helps create the place of the film, the busy neighborhood of Greenwich Village that, even at night, is never quiet. However, the sound also produces the mood of the film. At Rear Window’s tensest moment, the ambient noise stops. All we hear are the killer’s approaching footsteps. Even if the viewers don’t realize that the sound of the film has changed, they are affected by it. Here’s the truth. I don’t know why I like Rear Window so much that I put it ahead of every other motion picture I’ve seen when I have to choose my favorite. I can let you know what’s worth appreciating about the film. But I can’t tell you what alchemy it is that turns all that into something so special for me. A couple of years ago I saw “Rear Window” on the big screen. Like you, I have lost track of the number of times I’ve enjoyed the movie, and the audience was packed with others of the same ilk, judging by the pre-show conversations. Yet again, once the film started there was nothing but rapt attention as we all fell under its spell once more. You are right. It is alchemy. Great post! You pointed out a lot of things that interest me so much about the film. Rear Window is my favorite Hitchcock, coming out just a hair over North by Northwest. I recently saw this film twice (!) in a theater and it was so cool. I knew exactly what was happening, but my heart still pounded at the ending. And it made me appreciate Wendell Corey’s performance much more. The little faces he makes are subtle, but very meaningful. Nice contribution to the blogathon! Despite your initial apprehension, I’m glad you took the time to express why you like the movie so much. The movie had me in its clutches when James Stewart helplessly watches Grace Kelly get manhandled, his voyeurism turning upon him to haunt him. Excellent review! Really great review! I enjoyed your mention of little details like the birds, the music, and the ambient noise. It’s hard to believe it was a set because everything seems so real! Thanks for a fun read! Like you, I sometimes have a hard time explaining my love of certain films (e.g., MARNIE). However, you’ve done a wonderful job explaining why REAR WINDOWS continues to find new audiences after all these years. I love your comment: “It builds a protagonist, a seeming bystander, who is thoroughly intertwined with both the crime of the film and this theme.” And I agree that Corey, in his best role, is often overlooked. Well done! 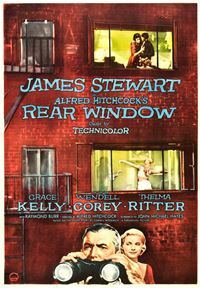 There is something about Rear Window that is just fun. Maybe not even quantifiable, it’s just fun to watch and enjoy. That said, your two paragraphs about the parallelism of Jeff and Thorwald are fine film criticism! Great post. You make a good point about the timeless acting in Rear Window. The performances feel fresh, no matter how often you watch it. Combine that with the clever script and the ingenious set design, and you have one amazing film. This is a great choice for the blogathon. By far, my favourite Hitchcock film.